There are only a few commercial rafting companies that run trips on the North Stan, and the season is short, but they will take care of the shuttle, provide you with guides who are experienced on the river, and serve up a delicious lunch. If you’ve never boated Class IV+ or are unfamiliar with the run, going with a guide who knows it well is always a good idea. No permits are currently required, but it’s good to remember that you are running through Stanislaus National Forest lands, so all normal rules and regulations apply. Most people don’t do intentional overnight trips on the North Stan. There are great campgrounds (that are typically uncrowded in the spring) in the area if you are looking to boat for a few days. Camp at Calaveras Big Trees State Park and enjoy some of the most awe-inspiring Sierra Redwoods in California. You might even be inspired to become a “tree hugger” and see if you can wrap your arms around one of the giants. You will have to run your own shuttle on the North Stan – no official shuttle services operate here. You’ll also be hard-pressed to find other boaters most of the time. With that being said, the shuttle is not too painful. A few long miles on dirt roads, but a 4wd vehicle is recommended in muddy conditions. Make sure the snow on the roads has melted though! To get to the North Fork of the Stanislaus River, you will have to drive through some of California’s most beautiful foothill countryside. The North Stan is located on Highway 4, east of Stockton. In the town of Angel’s Camp, where Highway 4 intersects Highway 49, head east on 4 toward Murphy’s. If you have time to stop in Murphy’s it is well worth a visit, since it is one of California’s most charming foothill towns. Head past Murphy’s until you get into Calaveras Big Trees. You can set a shuttle here (follow directions below) and continue on to the put-in, or set your shuttle later. 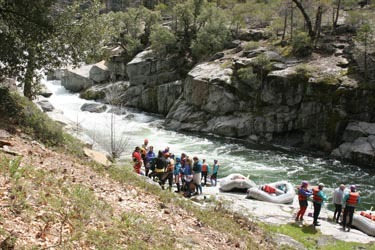 There are also places to camp in the state park or in Stanislaus National Forest. From Highway 4, head east past Calaveras Big Trees State Park about 4 1/2 miles. Go right on Board’s Crossing Road. Go 2 1/2 miles and when a dirt road veers off to the right, STAY LEFT on Board’s Crossing (turns into 5N02) and drive about 3 more miles to Sourgrass Campground.